I really enjoyed creating this piece. Tigers are one of my favorite animals. I have drawn a few in the past but none in color surprisingly enough! I didn’t put that many tangles into this one or any for that matter. Tigers, I feel, are a walking Zentangle all on their own. I didn’t need to add “patterns” to the drawing because their entire coat is a pattern. I didn’t want to take away from the tigers natural design; it’s fascinating as it is. When you see a tiger, the symbolism kind of screams at you! They are beautiful, visually striking creatures. They have highly contrasted stripes which represents the light and dark. The new moon and the full moon. The balance of opposites. They also are exceptional swimmers connecting them with the energies of water as well as earth. They are both sides of the coin. They take the good with the bad because balancing the two makes them tenacious! The tiger is very powerful and strong. They are also sensual and represent passion. When they hunt, they are silent and slow. They mainly hunt at night. You may realize the same for yourself if the tiger has presented itself to you. To attain your goals, you must hunt like the tiger. Be slow and precise. Calm yourself when you strike to ensure a higher success rate. Tigers are devoted mothers. They care for their cubs until they are old enough to feed themselves, usually until 16 months of age. The mother teaches them everything they need to know until they are fully prepared to live on their own. Other than that, they are solitary creatures. Take care of the ones who depend on you but make sure you take some time for yourself as well. You cannot take care of others if you do not care for your well being first. Tigers are very sensual. Perhaps you should follow suit, surrounding yourself with things that excite your senses. Have you lost your passion for life? Are you feeling down about what you are trying to achieve? Tiger will show you the way. New adventures are in your future and you will be able to find your motivation again! Stay strong like the tiger and you will be able to attain any prey that is in your sight. Strike slowly yet confidently. Fret not, a passionate life awaits you so long as you have the strength to keep traveling towards it! Listen to your senses. You already know what is good for you! Allow yourself to be open to the pleasures of life. Thanks for stopping by this week! I hope the tiger was able to offer you some guidance. Check back soon for the next totem I’ll be going over, one that will test your sense of smell! Now that Inktober is complete, I can get back on track with my totem animals. I left off with Tiger. This piece is just about finished. I haven’t touched it in a month and the funny thing is it will probably only take me another 20 minutes to complete! Once I have it finished I will share the finished piece and the wisdom that Tiger has to share with us. Thanks for stopping by! Check back soon for more! Ok, so this piece didn’t exactly come out as a ZIA (zentangle inspired art). The more I looked at the image, I realized how difficult it was to incorporate different patterns into this animal because it’s basically a giant zentangle all on it’s own. I didn’t want to take away from the tiger’s natural pattern so I went for a more classic pen and ink drawing. I used hatching, parallel lines to create tone and texture, throughout most of the piece. I have always liked how this looks and haven’t dabbled with the technique anymore than this drawing and some random sketches I did for “Inktober” last year. Hannibal Lecter from “Silence of the Lambs”. I don’t know why but I really enjoy drawing bones, especially skulls. I have always admired elephants. They are wisdom keepers. The whales look after the sea and the elephants look after the lands. Chucky from the movie “Child’s Play”. Just like puppets, I hate dolls! Pediophobia, the fear of dolls. I want to work with this technique more and I also miss doing my pointillism or stippling. I’ll be squeezing a couple of those in as well while I continue to work on my totem animals. As for my tiger, the ink is finished. Next, I will be working on the color. This piece is considerably larger than my other totem animals, going from 5.5 in. x 8″ to 12″ x 18″. I had much more space to work with and I think it is paying off. I was sticking with the smaller size because I wanted to be sure I completed them in a timely manner. The tiger doesn’t seem to be taking any longer than the smaller pieces do and it is coming out so much better. The next time you see the tiger, it will be completed and we will check out what symbolism they hold. Thanks for stopping by this week. Let me know what you think in the comments below! Working on my tiger while hanging out with my tiger. So nice of her to leave me a bit of room on the edge of my chair. With that face though, she gets whatever she wants. Damn cats! Excuse the messy desk. I’m a bit cramped in my lil’ studio but I’m happy to have one regardless. I am having fun drawing the tiger. I honestly didn’t know what to do with it in the beginning but it’s starting to come together. Hey All! I’m getting back on track with my totem animal drawings. I started the sketch to a new one today. I will be taking a break from my “Megtography” so I can start focusing on my artwork more. It is quite a challenge posting a photo a day, especially an interesting photo a day! Kudos to all the photographers out there that can keep up with it! For me though, my artwork is more important so I need to get back in the flow with my drawings! To spice it up, I am working on the mighty tiger. I have a huge adoration for big felines and tigers are one of the most striking! Check back soon to see the completed piece and learn about tiger symbolism. Thanks for stopping by! It has been a month since I have posted a drawing. I don’t like taking long breaks but I always know it’s coming when summer hits. There is so much going on that it is hard to keep up with. I have soooooooo many photos to go through from all the activities and travels from July and August. Not to mention the list of totem animals I have accumulated that I need to complete and research. When I go so long without getting any drawings done I start to get itchy. I decided to keep it light and simple. I drew a picture of my son’s cat, Chloe, in different contrasting colors. It was something fun and whimsical to warm me back up. I wanted to play around with colored pencils and flamboyant colors. I’ve created other pieces like this in the past and would like to keep up with it as something I can always come back to when I need a break from my totem drawings. They are fun to create and allow me to be a little funky with my approach. What do you think? Thanks for stopping by! Check back often for daily photography and updates on my current totem animal project. Do you ever feel like you’ve barely solved one problem only to be immediately bombarded with another? You’ve just recovered emotionally from one hardship just before another one sucker-punches you in the gut. I’ve been incredibly overwhelmed lately in just about every aspect of my life. I’m trying to keep a cool head and go with the flow as I like to say. I usually turn to my artwork to alleviate my stress but even that has brought it’s own hurdles. I’ve gotten myself to the point where I am so concerned with perfection, I hinder myself from being allowed to make mistakes. This has caused incredible tension with little to no relief. How can I release this anxiety? Then I came across zentangle. It is a style of art created by Maria Thomas and Rick Roberts. The true art is created on a 3.5 inch “tile” of white untextured paper. 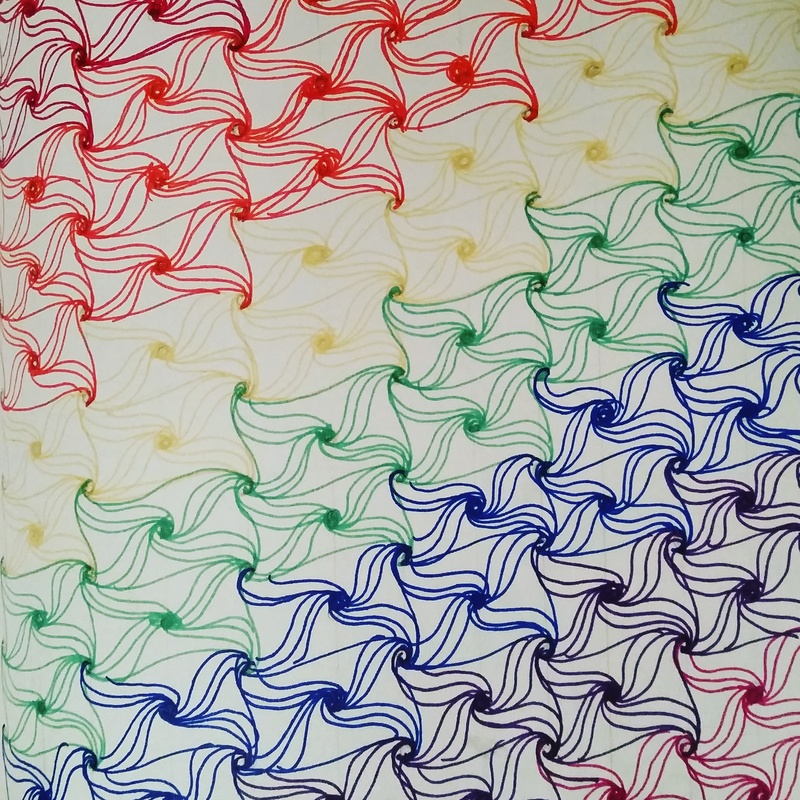 The drawing is done in black ink and consists of intertwining patterns, or tangles. This art form is non objective being a form of artistic meditation. There is no right or wrong, only what you decide. 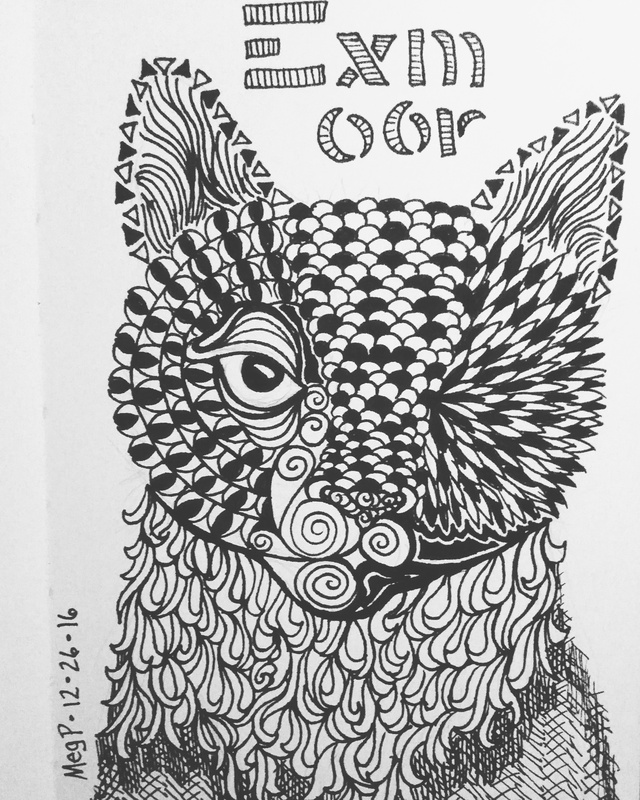 I’ve been doing some zentangle inspired sketches lately as a way to “get my crazies” out. I’ve only done two sketches but am amazed by how it calms me. Plus, there is no added pressure for getting details exact. It is pure zen art. You can learn more about true zentangle and check out the starter pack here. I would like to get the starter pack for myself to learn more about the official art form. Try it out! Anyone can do it and it’s a great way to ease your mind or eliminate anxiety. What activities do you do to de-stress? Share your story below in the comments. Thanks for reading! About two months ago, my husband came home from work a little later than usual. I was not worried; I knew what kept him. My son did not. He was thrilled to see dad walk in with an itty-bitty kitty, our first family cat! We were all so excited. The kitten was so tiny, small enough to hold in the palm of your hand. He was a mess covered in burrs, ticks, and desperately needing a bath. His eyes were goopy, possibly an upper respiratory infection. He and his family were found by a friend of ours, abandoned in a box. They all needed care, so we decided to help and adopted one. He was frightened the first couple days. We cut the burrs out, bathed him and brushed him. He has long black fur with a regal mane. I love his unique white markings on his tail and face. He also has a white belly and paws. We decided to call him Exmoor. This was inspired by the cryptid, The Black Beast of Exmoor. It did not take him long to warm up to the idea of being an indoor cat. He warmed up to us quickly and took any chance he could to sleep in our laps. He already earned the nickname Purr Monster for reasons you can guess. His eyes seemed to be getting better as well. I was surprised by how lethargic he was, though. He hardly played like a kitten should. He slept all the time, a great deal even for a cat. He always wanted to stay in the bathroom and lay on wet towels. My husband suspected he was trying to stay cool. He was very calm for a kitten. Then one day, his eye started to swell. I immediately scheduled an appointment with the vet and took him in a couple days later. I was informed he had a virus, a kind of “cat herpes”. The swollen eye was beyond treatment and I was shocked when they told me it had to be removed. He also had a fever which would explain the seclusion in the bathroom. Over the next couple weeks we gave him antibiotics and eye ointment until his fever broke so they could start the surgery. I was worried for our new kitten but was assured that after the procedure, he would bounce right back. And so he did. They kept him for two days after the surgery. When we brought him home, he was instantly ecstatic! He was purring as loud as I ever heard. He seemed so thankful to be home with us. He really did miss his new home. Once he showed his love, he began running around like a basket case. He was literally bouncing off the walls. Though he was only a few pounds, it sounded like an elephant running back and forth across the floor. He used the couch like a jungle gym, leaping from cushion to cushion. He even ran up to both of our dogs and greeted them happily. Exmoor was a brand new kitten! Now, he sleeps all day and plays all night. He’s acting as kittens should, CRAZY! And the lack of an eye doesn’t seem to be bothering him at all. Well, except for his depth perception. There were those few times he jumped for the table and missed completely falling to the floor. It’s hard not to laugh, especially when he takes off like a bat outta’ hell afterwards. Only to come back later and try again. Exmoor is a great joy to have around and I feel great knowing that he really does appreciate what we have done for him. He has a lot of personality and is very intelligent. We lucked out with this one and he lucked out with us! Next week he will be getting his stitches out and his transformation to Cyclops Kitten will be complete. There have also been a lot more pirate jokes going around the house lately. ARRRRRR! We couldn’t have saved our kitten without the help of family and friends pitching in for the surgery. I am forever grateful to them. Sorry for the late blog post, as this has been one hell of a week for me! Thanks for checking in! I hope everyone had a great Thanksgiving. We have been having some great weather in my neck of the woods. I hope the same goes for you. I can’t wait to spend all my days outside again! I plan on doing some outdoor sketching this year. I haven’t done that in quite some time. At the moment, I am finishing up a beautiful cat portrait. He was my aunt’s cat who was recently hit by a car. It’s always sad to hear those things. Such a shame. Now that the warm weather is here, there will be little friends scurrying across the roads everywhere! Make sure to keep an eye out for them. Pete was a handsome boy. Here is an animal shout out I did for Sweet Pete. Here are a few other sketchbook pages I have done recently. I’m keeping this post short and sweet. Thanks for checking in today. Enjoy your week! Our white shepherd, Sasha. She’s 15 years old, our old wise woman! A cryptid studies page I did based off of the book “Cryptozoology A to Z” by Loren Coleman. A few of the insects I have photographed and then sketched. A skull I drew from my anatomy book.